Since about 6 decades the Dead Sea shore has been retreating, exposing herewith shore sediments consisting of alluvial deposits underlain by muds. Enhanced erosional processes by flood and base flows as a result of increasing gradients of slopes have incised deep gorges in the black mud sediments which have resulted in land collapses, landslides and shrinking fractures. Erosion has exposed structures resembling seismites and subaquatic fossil slidings. 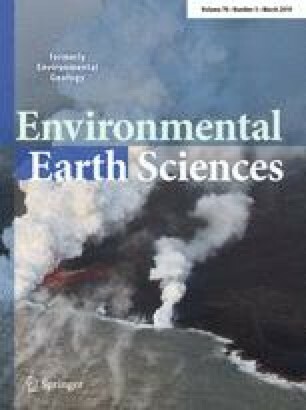 In this article, the degrading geology of the northeastern shore of the Dead Sea is described and the underlying geo-mechanical, mineralogical and chemical properties of the black mud sediments composed of silt and clay, partly covered by gravel and sand, are evaluated. Attention is also paid to the impacts of the degrading geology on the infrastructure of the area and remediation measures are recommended. The authors are highly indebted to Prof. Dr. Stefan Gayer, Halle University, Germany for facilitating the analyses of the engineering properties and hydrochemical parameters in the laboratories of the university. Many thanks are extended to him and his colleagues. Thanks are due to Mrs. Abu Alhaj for carrying out the analyses in Halle University. Sincere thanks are also extended to the anonymous reviewer for his constructive comments and suggestions for changes which have resulted in improved work.